The recently restored Church of São João Baptista (St John the Baptist) in Tomar, Portugal is located in the Praça da República, right in the heart of the city. There has been a place for meeting and worship on the site since the time of the Knights Templar in the 12th Century, but the present day building largely dates back to the early 16th Century when the church was rebuilt by Henry the Navigator, leader of Portugal’s Age of Exploration to a design by an unknown French artist and was expanded later by King Manuel. 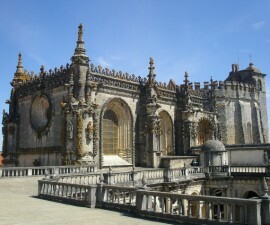 The church, and in particular its façade and grand entrance door, is an important example of Manueline architecture, the type of gothic inspired architecture that was introduced to Portugal at that time. 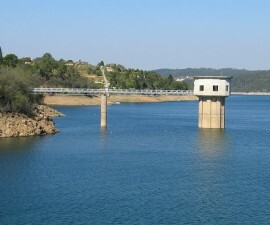 It has been well restored and renovated several times since 1875 and was classified as a National Monument in 1910. The Church of São João Baptista is built in a rectangular shape with three naves and features a bell tower, an octagonal spire and lavishly ornamented Manueline doorways on its northern and western sides. Its clock face was transferred to the church from Tomar’s Templar Castle where it had begun life. It is well worth entering the church to appreciate the black and white diamond mosaics and white and gold baroque altar. One of the chapels on the right side of the nave is faced with some nice examples of antique Portuguese tiles known as “diamond tip”. Gregório Lopes, one of 16th-century Portugal’s finest artists, painted the six panels hanging inside including his version of The Last Supper. The square around the church is the focal point for the Festival of Trays, a celebration of pagan origin, which takes place every four years and has its origins in the Festival of the Holy Spirit in the Azores. 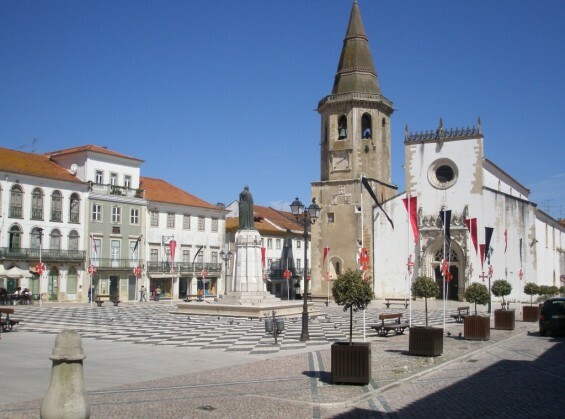 The Praça da República is a delightful square in its own right, home to an attractive collection of 17th Century architecture including Tomar’s Town Hall. 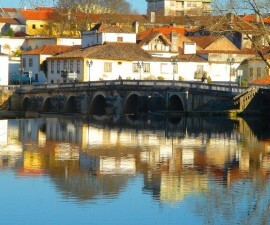 During the day it is a popular meeting place and the tourist train departs from here. Rua Serpa Pinto, the main street leading up to the church, offers excellent views of the square and of the Templar Castle beyond. At night the square and its most imposing buildings are illuminated, creating a beautiful setting for couples and families to take a stroll after dinner. There is no charge for entry and the Church of São João Baptista is open to visitors from 8am to 7pm all year round.